Ready for a larger-than-life steampunk fairy tale? 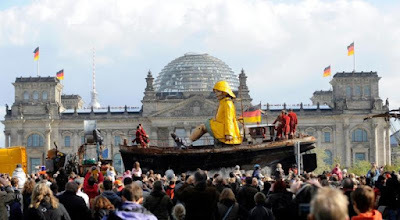 Today the giants (and their handlers) that have walked the streets (and rivers) of Berlin for 4 days are taking a well deserved rest after a happy reunion that mirrors the story of the city itself. 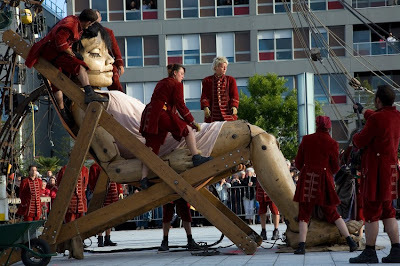 It's been almost 20 years since the Berlin Wall fell and this year, as part of the 19th annual unification celebration, the giant marionettes of French contemporary street arts/theater company Royal de Luxe staged a special performance, the story of which took place over 4 days. The company is bringing two puppets to Berlin. One is 9.5 meters (31 feet) tall and weighs 2.5 tons. 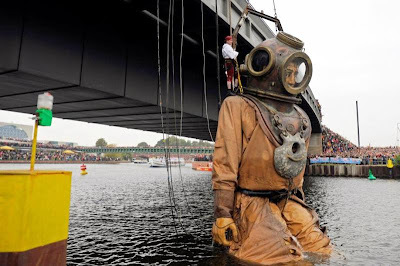 It is a deep-sea diver and will be wearing an atmospheric diving suit made out of truck tarpaulins as it makes its way through the city and its waterways, aided by 31 helpers decked out in red livery. The helpers are called the "Lilliputians," after the little people in Swift's book. 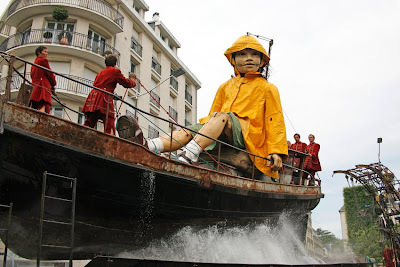 The smaller puppet -- at 5.5 meters (18 feet) and 800 kilograms (1,750 pounds) -- won't just be walking around; it will also be driving a scooter and a boat with the help of 22 Lilliputians. "It's a family story; it won't be political," Courcoult said... He went on to explain, his company will be telling a fairy tale about a long separation with the following plot: Terrible events have torn a city in two and caused one part of the city to be walled in. The big puppet is stuck in the west of the city, and the smaller one in the east. The big puppet drags a dormant geyser along the riverbed and places it under a wall. Then it wakes up the geyser to let it break down the city's barrier and allow the puppets to reunite. You can read the rest of the article, which also details some of the amazing technical specifications as well as a lovely photo gallery of the event, HERE. In 1912 the Titanic went down to the bottom of the ocean. Unknown to us, however, was that in its hold a giantess was held captive, the mother of the Little Giantess. 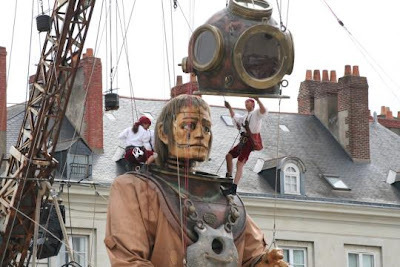 The enormous diver is the scouring the earth for the Little Giantesse. 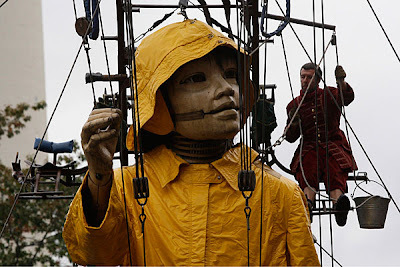 She was captured in Iceland which was at the time the home of the giants, each having his or her own particular task. The Little Giantess was to wake up the geysers of Iceland when a message needed to be sent. You may wonder what on earth geysers and messages have in common but little known to the outside world the geysers were used to transmit signals between the giants, much like the smoke signals of American natives. But where does the deep-sea diver properly come in to the story? He is the brother of the giantess who drowned on the Titanic. Originally he had been busy doing his own job – sawing up icebergs – to realize that his sister and her daughter were missing. In his past he has travelled the seabed for years and eventually he found the wreck of the Titanic. He buried his sister near the sunken ship. While there he discovered a mysterious box full of mail from the Titanic. He now had two new goals in life – the task of finding his niece and to deliver the mail. Since then he has wandered the earth in search of the Little Giantess. And, as you may infer from the photos, all obstacles are conquered and the happy reunion occurred, fittingly, in Berlin near where the Wall once stood. 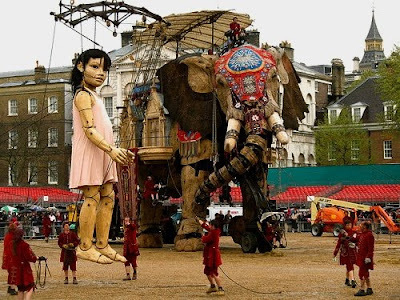 Royal de Luxe apparently has no website and does no ordinary PR (the city of London put together a beautiful web presentation - including an extensive gallery - for the famed 2006 appearance which included the Sultan's Elephant. You can see that HERE ) but this website HERE has a long, fantastically detailed, yet easy-to-navigate article on the company. 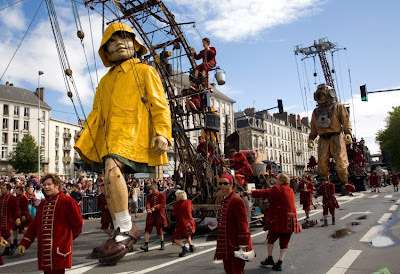 The fact that Royal de Luxe make these extraordinary characters out of discarded items and what is essentially junk, is part of the magic - transforming the ordinary into the extraordinary. Fairy tales do the same thing by putting just a little magic into a tale, creating Märchen or 'Wonder Tales'. It is very fitting that these puppets have become part of the world and story of fairy tales. I sincerely hope I one day have the opportunity to experience one of the 'chapters' of these giant stories in person.